Hello ♡ I equally love each season, but I just happen to love the Fall season a little more. I think everyone can agree they love the idea of being cozy and sitting in front of the fire while drinking their Pumpkin Spice Lattes. That is why I have compiled a list of several beauty favorites for the Fall season inspired by Vivianna Does Makeup's very own Autumn Edit. I think I might continue and add another section for fashion and random favorites. Lancome Teint Miracle- This is probably my favorite foundation in the whole world because it looks like skin, but it gives a very healthy glow. It have very tiny shimmer particles that complement the shade that can be seen in the bottle, but can't be seen on skin. There is a dupe for this called Magic Lumi by L'Oreal. EOS Lip Balm- I don't really feel this great hydrating lip balm. It keeps my lips from becoming too chapped or dry. I like that is a solid formula and has hardly any stickiness. Rosy Lip Tint 'Sunny Flower'- For Fall lip colors, you need to try a bold lip color. If there is anytime to try it would be for this season. For reds, don't go for a normal red, but go for a different red either really dark or very light. Here is a bright orange-red. It came out in the 'And Rose' collection from Etude House and it has a matte finish. Review coming soon! Super Stay 10 Hour Stain Gloss in 'Ruby Indulgence'- This has to be my favorite lip product for the Fall season because it is a stain, and it has an awesome applicator, and it has a great shine, and to top it all off it has a reddish-plum color. Urban Decay Naked Basics Palettes- It has all matte colors for a natural look including one satin color called, 'Venus' great for the inner corner and brow-bone. You can also go darker with 'Faint' and 'Crave' or just have a skin shade like 'Foxy' and 'WOS'. I also like using 'Crave ' over my eyeliner for a matte finish. Avon Ultra Luxury Eyeliner in 'Black'- I like the formula of this eyeliner because it smudges easily. One thing that I don't like about pencil eyeliners is that I feel the sharpened point on my eyelid, but the only time it is smooth when there is no precise point. L'Oreal Lineur Intense in 'Black Mica'- This is my favorite liquid eyeliner. It is supposed to be a dupe for the Lancome Art-liner (minus the staying power and intense color). It creates the perfect cat-eye. Maybelline The Colossal Volume Express in 'Glam Black'- When I have an intense cat-eye, to create balance I use a volume mascara to get sky-high lashes. It also has a wet formula making it easier to build up your lashes. 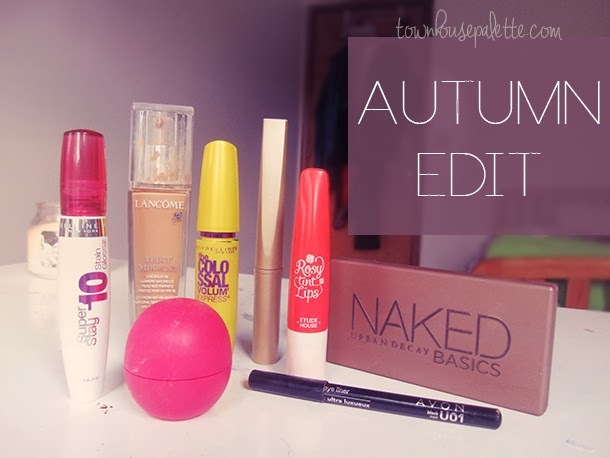 What are your favorite Autumn necessities? I'm glad to see you liked your Rosy Tint Lips. Unfortunately, I wasn't that wowed by it. It wasn't the color I hoped it would be. Too bad:( What color did you get? That lip stain looks great, so pigmented! I think I will have to put that on my list! I love the Etude House Rosy Lip Tints! The color you have is beautiful!